As a dog owner, I know the feeling you get when you take your dog on a ride. Or in this case, dogs. This photo is part of the Dentation project Nabiis is working on with Doubledog and HK Fixed. 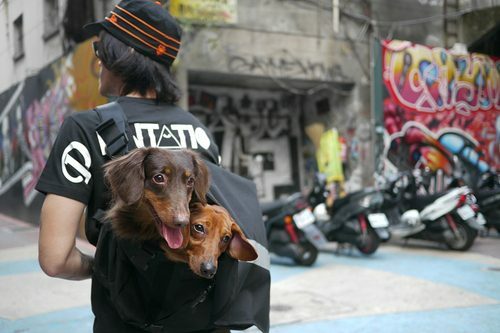 Two dogs, stuffed in a messenger bag, are fitting mascots for China’s first independently-owned streetwear company and their first collaboration with Nabiis and HKFixed. Check out the rest of the photos Nabiis posted from their Dentation/015 photo shoot on their Flickr and read more about the Dentation project here.